The index below is always in progress. Individual names are indexed by last name even though I include their first name in front. Click on the letter of the alphabet and jump to it. to search for specific words on this page. Follow these easy instructions below based on the web browser you are using. In Internet Explorer click on Edit on the Toolbar at top and select Find (on this page), then type in the word or words you wish to find in the resulting dialog box. In Netscape click on Edit on the Toolbar at top and select Find on page, then type in the words you wish to find in the resulting dialog box. Mumia Abu-Jamal-Taped speech on May 4, 2000 at 30th Commemoration on May 4, 2000 page. Ramona Africa-Speech on May 4, 2000 at 30th Commemoration at KSU. Click the following links for photos of Ramona, Photo1 Photo2 Photo3. Guilt Trip-A "Your Story" submission with text,poetry and photos of Bill Arthrell's trip to Vietnam in 1998. Napalm the Dog Incident-I'll let you muse over this one. Story as told by Daily Kent Stater, March 1970. Julliette Beck-Speech on May 4, 2000 at 30th Commemoration at KSU.Click the following links for photos of Julliette. Photo1 Photo2 Photo3. Vernon Belleourt-Speech on May 4, 2000 at 30th Commemoration at KSU. Click the following links for photos of Vernon, Photo1 Photo2 Photo3 Photo4. BUTTONS-Over the years Kendra has designed 5 special commemorative buttons, one each honoring the four murdered students and one commemorating May 4, 1970. View and order form. Noam Chomsky-Speech on May 4, 2000 at 30th Commemoration at KSU. Click on the following links for photos of Noam, Photo1 Photo2 Photo3 Photo4. Court Trial Chronology-A short list of court activity surrounding the events of May 4, 1970. Jackson State Chronology-Text description of events at Jackson State on May 14, 15 1970 where 2 students were killed and many others wounded while protesting racism and the war. Photos of memorial and bullet holes in Alexander Hall. 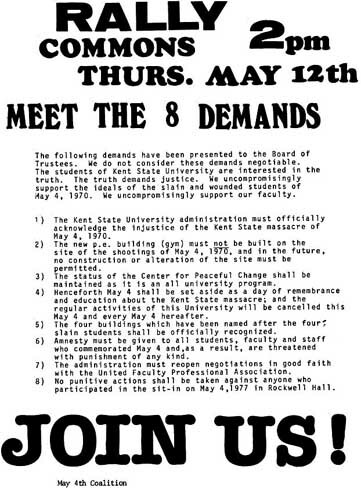 Kent State May 4, 1970 Chronology-Text description, by date, of events at Kent State from April 30, 1970 till the shootings on May 4, 1970. Photos hyperlinked to text. Tent City and Gym Struggle Chronology-Describes by date increments the history of KSU's planning for a gym annex on campus though most of Tent City and the Gym Struggle. Chronology ends on August, 18, 1977. Contains map of disputed area. Link to Tent City and Gym Struggle Home Page for more extensive information. COMMEMORATIONS-Reports and photos on selected annual May 4 commemorations at Kent State. CROSBY, STILLS AND NASH-I don't have the words to Ohio yet but I do have some individual photos of Crosby, Stills and Nash taken on May 4, 1997 on the KSU Commons. Photo 1, Photo 2, Photo3, Photo4, Photo 5. KENDRA LEE HICKS-THE Kendra of Mike and Kendra's Kent State, May 4, 1970 Web Site. Click on the following links for photos of Kendra, Photo1 Photo2 Photo3 Photo4 Photo5 Photo6 Photo7 Photo8 Photo9 Photo10 Photo11 Photo12 Photo13 Photo14 Photo15 Photo16 Photo17 Photo18 Photo19. Click on the links below for more on Kendra. Tribute to Arthur Krause, father of slain student Allison Krause on May 4, 1989 at 19th Commemoration at KSU. Testimonial for Allison Krause on May 4, 1997 at 27th Commemoration at KSU. Buttons-designed by Kendra, a series of 5, one each for the four murdered students and one Kent State, May 4, 1970 button-You can find out how to obtain them from this link. Julia Butterfly Hill-Speech on May 4, 2000 at 30th Commemoration at KSU. Four Students-Photos of Allison, Sandy, Jeff and Bill accompanied by a commentary written by Mike on Heroes. Links to more info on four. Testimonial by Kendra Lee Hicks for Allison Krause on May 4, 1997 at 27th Commemoration at KSU. ARTHUR KRAUSE-Tribute to Arthur Krause, father of slain student Allison Krause on May 4, delivered by Kendra Lee Hicksin 1989 at 19th Commemoration at KSU. Photos of Arthur, Photo 1 Photo 2 Photo 3 (all from Tent City). William Kunstler-This links to information about him and provides links to five speeches given at Kent State at 4 annual commemorations. Photo of Bill also. Mac LoJowsky-Testimonial for Bill Schroeder on May 4, 1997 at 27th Commemoration at KSU. Barry Levine-Testimonial for Allison Krause on May 4, 2000 at 30th Commemoration. Link here for photos of Barry, Photo1 Photo2. Position Paper of the May 4 Coalition. Tent City and the Gym Struggle-Link here for a short story on the founding of the May 4 Coaliton and a link to our comprehnsive index of Tent City and the Gym Stuggle. Truth Demands Justice-Newspaper of the May 4 Coalition. This links you to the first page of the first edition. Link to other pages of that edition from the first page and link to other editions via link to submssion page. MAY 4 TASK FORCE-The Task Force is the student group that organizes the annual May 4 1970 commemorations and has been or primary importance in preserving the truth about the events of May 1970 over the past 30 years. This link provides a short history of the group and a link to their wesite. Prentice Lot History Page-Begin here for full story on the Controversy and photos from the 1998 commemoration demonstration which initiated the whole process. Carol Meyers-Testimonial for Jeffrey Miller on May 4, 1997 at 27th Commemoration at KSU. Testimonial by Carol Meyer for Jeffrey Miller on May 4, 1997 at 27th Commemoration at KSU. The Truth Demands Justice-A newspaper put out by the May 4 Coalition, the umbrella group that coordinated the protest of the gym and set up Tent City. Contains most of the text and photos for the 4 editions that were issued.The link is to the first page of the first edition. Link from this page to all other editions. Thirty Years Later-Kent State, May 4, 2000-An article written by Mac LaJowsky, former Kent Student and May 4 Task Force member for the American Humanist. Includes another type of May 4 chronology and a report on the Task Force's program on May 4, 2000. Annual May 4 Commemorations-Link here and connect to pages containing photos from numerous May 4 Commemorations held at Kent State. Bill Schroeder-Photos of Bill Schroeder before he came to Kent State. Day Without Pentagon Demo-Mike traveled to DC in November of 1998 to demonstrate with others our dismay with our nation's military spending budget and to advocate the redirection of funds to more important and needy priorities. Of course there are photos. Kent State:A Requiem-Photos of the theatre production performed at Kent State in May of 2000 as well of photos from previous productions. Link to the Requiem home page for history and photos of the play. May 4 Memorial-photos of Memorial and the struggle to have one built. May of 1970-Hyperlinked to text of May 4 Chronology. Vietnam-Photos from Vietnam taken by Bill Arthrell former KSU student and eyewitness to the May 4 shooting. Accompanied by a narration of the 1998 journey. Links Page-Links to other sites dealing with May 4 issues as well as links to selected activist sites. Research Advice-Stop here first if you've got a paper or report to do on May 4, 1970. Hopefully, this will give you a direction to take. Four Students-Photos of Allison, Sandy, Jeff and Bill accompanied by a commentary written by Mike on Heroes. A "Your Story" Submission with photos of Bill Schroeder before he came to Kent State. Testimonial by Mac LoJowsky for Bill Schroeder on May 4, 1997 at 27th Commemoration at KSU. Introduction to 30th Commemoration, May 4,2000 at KSU. BARRY SEYBERT-Over 60 of Barry's photos taken during Tent City and the Gym Struggle in 1977. Ramona Africa-Speech on May 4, 2000 at 30th Commemoration at KSU. Vernon Belleourt-Speech on May 4, 2000 at 30th Commemoration at KSU. Julliette Beck-Speech on May 4, 2000 at 30th Commemoration at KSU. Noam Chomsky-Speech on May 4, 2000 at 30th Commemoration at KSU. Kendra Lee Hicks-A tribute to Arthur Krause, father of slain student Allison Krause on May 4, 1989 at 19th Commemoration at KSU. Kendra Lee Hicks-Testimonial for Allison Krause on May 4, 1997 at 27th Commemoration at KSU. William Kunstler-This links to information about him and provides links to five speeches given at Kent State at 4 annual commemorations. Barry Levine-Testimonial for Allison Krause on May 4, 2000 at 30th Commemoration. Wendy Semon-Testimonial for Sandra Scheuer on May 4, 1997 at 27th Commemoration at KSU. Wendy Semon-Introduction to 30th Commemoration, May 4,2000 at KSU. Guilt Trip-A "Your Story" submission with text, poetry and photos of Bill Arthrell's trip to Vietnam in 1998. Vietnam War Links-Find out about the war which sparked an era of protest.